Fallout fans take their lore seriously, and last week a post suggesting Bethesda had retconned the Brotherhood of Steel into Fallout 76 prompted many to furiously debate the organisation’s roots. The discussion stemmed from an in-game note from Fallout 76 which mentions the Brotherhood of Steel’s extended involvement in Appalachia – the Fallout name for West Virginia. For many fans, this was problematic, as according to established Fallout lore the Brotherhood of Steel should not have emerged from their Californian bunker until around the year 2150. Fallout 76, however, is set on the other side of the country – in 2102. As such, the question on everyone’s mind was: how on Earth did the Brotherhood get to Appalachia so quickly after an apocalyptic nuclear war? 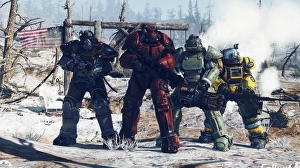 Thanks to an Instagram post by Bethesda, the Brotherhood of Steel’s presence in West Virginia has now been explained.